FILE - President Donald Trump meets North Korean leader Kim Jong Un in Hanoi., Feb. 28, 2019. 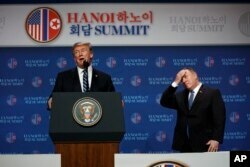 FILE - President Donald Trump speaks as Secretary of State Mike Pompeo looks on during a news conference after a summit with North Korean leader Kim Jong Un in Hanoi, Feb. 28, 2019. 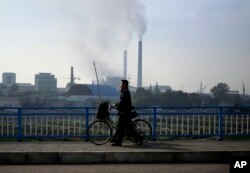 FILE - Smoke billows from the chimneys of Pyongyang Power Plant, which supplies much of the power and hot water needs for central Pyongyang, in Pyongyang, North Korea, Oct. 21, 2018. U.S. President Donald Trump said he walked away from his second summit with North Korean leader Kim Jong Un because Kim demanded the U.S. lift all of its sanctions, a claim that North Korea's delegation denies.